New wicking design! Changeable Coils! Designed for the CE4-CC (Changeable Coil) Clearomizer included in our SmokTek eGO CE4-CC kits in 650 and 1100 mAh. 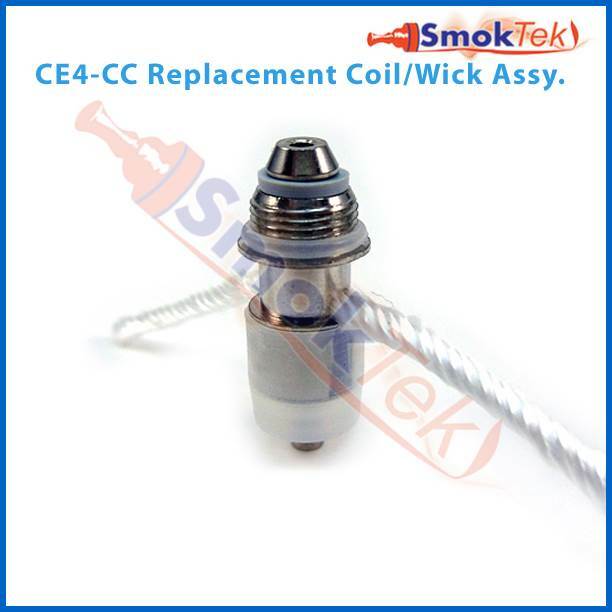 Please note that this coil head will not fit any other atomizer. Extend the life of your clearomizer by replacing only the coil! It's easy to do: unscrew the tip and the tube, then simply unscrew the old/used coil from the base and replace it with a new one. Put the tube back on, tilt at a slight angle and fill with e-liquid (be careful not to drip any inside the center tube - that is for airflow. Put the drip tip back on and lay the clearomizer aside for a few minutes, while the new coil saturates fully with e-liquid. Great product! Makes things way easier and cheaper. Rather than buying a whole atomizer/clearomizer, get this one and change whenever you wish. You could get a few of these with the same money that you will pay for an atomizer/clearomizer. Thanks a lot, SmokTek! I absolutely love the Changeable Coil Clearomizer because unlike the Atomizer that came with my eGo e-cigarette, I get full flavor with every hit. The replacement coils make it so much cheaper to vape since you don't have to buy a new Clearomizer every time it burns out. It works perfectly. Q: I purchased an ego kit eGo CE5 silver and want to know if I can replace just the coil and which coil is it?